Recently I've come across a few sites that will tie window scrolling with animation. When used in a subtle, small fashion, this is kind of cool. When used to change large portions of the view or really screw with scrolling, I detect it. Like most things, it all comes down to how you use it I suppose. But I was thinking recently - how can we do this with Edge Animate? Turns out it is rather simple. I began by creating a simple animation of a box moving from left to right. That is - unfortunately - the best I can design. Don't blame Edge Animate. Blame me. Next, I disabled autoplay for the animation. If you can't find this, be sure the Stage is selected and uncheck the box. With autoplay turned off, I then figured out what I needed to do to tie scrolling to animation. First, I need to ensure the animation stays visible. Second, I need to detect a scroll event. Third, I then need to figure out how much the person has scrolled against the total amount they can scroll. Basically, what percentage? Let's break this down. I began by working in the animation's creationComplete event. I added an onscroll event first. Basically this is a repeat of my other code, which is kinda bad, but notice the setTimeout. 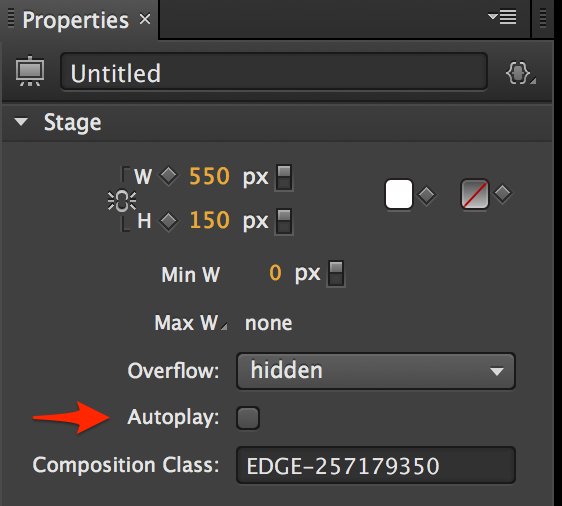 Edge Animate has a bug - or quirk - with working with the DOM in creationComplete. I've run into this before and setTimeout, while lame, works around it. Here is my creationComplete code then as a whole. And it works awesome! Well, to me anyway. Check it out here: https://static.raymondcamden.com/demos/2014/sep/29/stickandscroll/Untitled-2.html. Of course, that's my ugly version. Imagine if someone with some decent design skills tried it. Elaine did so - and with help from other Adobians (Max Vujovic and Bem Jones-Bey) came up with this much cooler version: https://static.raymondcamden.com/demos/2014/sep/29/elainesample/scroll.html. Check it out!